It’s Saturday, so it must be hill climbs. I was having (yet more) work done on my car so I was limited in the choice of hills I could climb today. But that is OK as I was close to Fox Road, so that is where I headed. Just like last weekend, there was low clouds that was almost fog. But this weekend, I dressed a bit better. I wore my winter cycling shoes, wool socks and brought two sets of gloves with me – a light climbing set and a heavy descending set. I was ready. I decided to ride up State Street – a good, long climb. As I gained altitude, the clouds became more than fog and less like clouds. The temperature dropped also, dipping down from the low 40’s to the high 30’s. After reaching the end of State St., I continued on Doerfler Road and came upon some trash that someone had left along side of the road. People, please pick up your trash! After Doerfler, came Fox Road to Drift Creek to Victor Point and back to Fox. This loop is 8.7 miles long and I did it twice, just because it’s twice as nice. I tested out TrainerRoad (www.trainerroad.com) tonight. Easy to set up, easy to pair my ant+ devices (powertap wheel and heart rate monitor) and went for a ride. The website offers a multitude of workouts and I just pick the first one that seemed interesting – California Roads. Once loaded, I learned that the video that goes with the workout is an extra cost item, so instead I watched my DVD of the 1992 Raris Roubaix. I have to admit that this workout hurt me as much as the cobbles were hurting Greg LeMond. I was not completely rested tonight, and as such, I found myself tiring quickly. The workout is 55 minutes long, but I shorten it by ten minutes. Nonetheless, it was fun! Such a beautiful night for a ride! Eight of us got to enjoy a perfect night for a ride. At 6:30 pm, the temperature was 58° F! Because there was no wind, there was a bit of ground fog near the river, but overall we were quite happy with the weather. Last week, I got in 9 hours and 23 minutes of training on five rides totaling 127.1 miles. Monday was a short and fast ride around Windsor Island. Tuesday I intended to ride the trainer, but instead I attended the Salem Bicycle Club monthly meeting. Wednesday was our Keizer Night Ride on a rainless night. Thursday was an intense hour on the indoor trainer. This session really knackered my legs! Friday was a rest day. Saturday was an epic climb up Larch Mountain. I did my core workout on Monday, Thursday and Sunday. In addition, I did my noontime walk on Monday, Wednesday and Friday. After yesterday’s mountainous ride, I needed something a bit easier. The Salem Bicycle Club afternoon ride was perfect. My car need work at a shop in far east Portland. 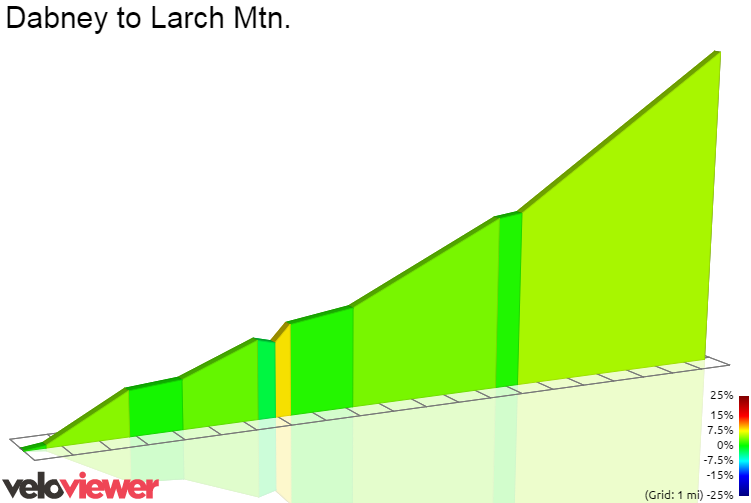 I had not climbed Larch Mountain since the TT in 2013 (I had a conflict this year). So, why not drop my car off at the shop and go for a ride, up a mountain, which was in the clouds. The weather was as good as can be expected for early November – cool, cloudy with a slight chance of rain. I decided to ride the Litespeed, my ‘it’s not raining now but might be’ bike. I dressed well – both arm warmers and leg warmers, a long sleeve jersey and my wind proof vest. I went with long fingered gloves, but my lightest pair. I left at home my booties and a wind or rain jacket thinking that my wool socks were enough to keep my toes warm. As you can see, the ride was mostly flat to the base of the mountain and then climbing to the top. There, I reversed my direction and took the same roads back. I took Stark Street to the base of the mountain. Stark is not stark – it is four lanes with bicycle lanes. I had no issues with traffic, but there was a lot of it. Stark Street passes Mt. Hood Community College and after the school the traffic lessens and the riding is nice. Soon, I was crossing the Stark St. Bridge over the Sandy River. The climbing now begins. 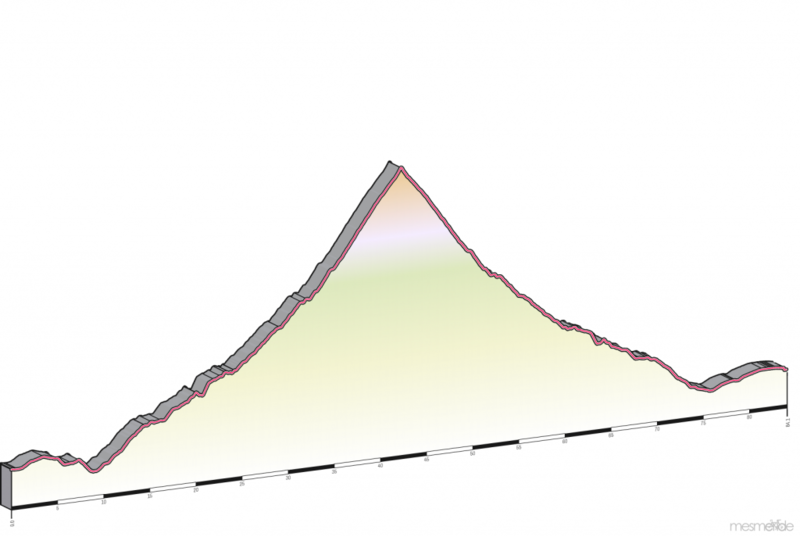 The climb is 20 miles long, and gains 3,800 feet for an average of 3.5%. However, the grade is not constance; there are some small descents, some flat sections and some steep sections. 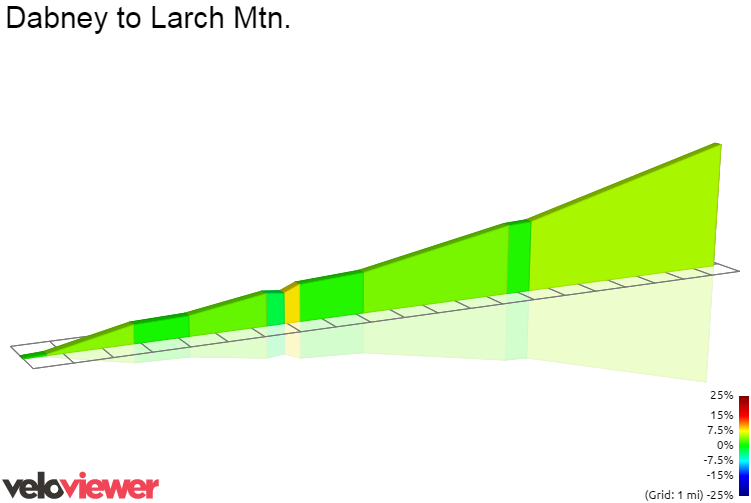 The maximum grade is 25.6% and yes, it is the final few yards up to the top. Killer. The first part of the climb is on the Historic Columbia River Highway pass the small town of Corbett and up to Woman’s Forum State Secnic Viewpoint. With the low clouds, the view was obstructed. 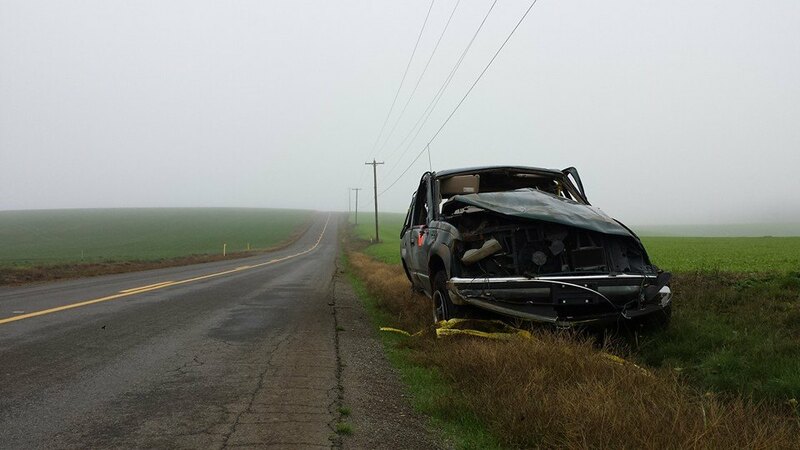 I could not see the Columbia River, the Gorge or Crown Point. I saw clouds. In fact, I saw clouds all of the way to the top. And at times they were thick. I turned on my headlamp to blinking mode so I could be seen by vehicles (and their drivers) coming down the mountain. I did the climb in ‘long climbing mode’ keeping my heart rate relatively low but working hard enough to sweat. Mile after mile I climbed. I was hoping to come to the only hairpin turn which would mean that I was only three and one half miles to the top. After many false hopes, the hairpin came into view and I started up the last stretch of the climb. My clothing was keeping me warm even though I was riding in a cloud, but I thought the descent would be cold. I finally reached the last turn and the grade increased to ‘why on earth would I ever want to ride this’. The parking lot came into view and I was at the top. But, over achiever that I am, I rode to the highest point in the parking lot before turning around. I now had a 20 mile descent in front of me, and I found out I was seriously under dressed. My light gloves were woefully inadequate and my fingers soon turned to ice. The fog seemed thicker now and with the water droplets on my glasses, I could barely see. My thoughts went back to a very cold descent off of Mckenzie Pass, and I comforted myself knowing I did not feel that cold. But I was cold, very cold. This was a test of character. Would I flag down a vehicle and plead to be taken off of this mountain, or would I be rugged and ride my bike down. In the end, I toughed it out and made in down to Corbett where it was much warmer. I later found out that I had been descending in 32° F. Ouch! The rest of the descent was nice as I was no longer freezing and soon I was back at my starting location. Next time, I will bring better gloves. Today is my scheduled rest day, so my October riding is done. This year, I rode 519 miles and trained for 39 hours. I’m happy with that. Last year was more intense – 662 miles with 49 training hours. I must be getting old. Tonight, I rode to “The Hunted” by Sufferfest. This vid is an hour long and contains a 20 minute climb with surges. Then, you get to do five, increasing sprints. The first is 10 seconds long with a 50 second recovery, the next is 20 seconds long with a 40 second recovery. This goes on until the fifth and final sprint is 50 seconds long after just a 10 second recovery. The graphic reflects my effort. The blue line is speed, the purple line is power and the red line is heart rate. My heart rate at the beginning was 129 and it peaked at 160 bpm. After my trainer session, I did my core exercises. I’m having work done on my car in Gresham. If the part comes in before this weekend, I will have the work done on Saturday and ride Larch Mountain while the car is being repaired. My Phonecasts. Load this page if your computer does not display flash content.